These pages contain descriptions and photographs of a number of the rivers which appear most frequently on our quarterly programme, or which we often use for fall-back trips or short notice paddles. Because they are so familar to club members, they tend to be under-represented in trip write-ups, but they are perhaps the rivers that new or prospective club members might most want to know about before joining a club trip. 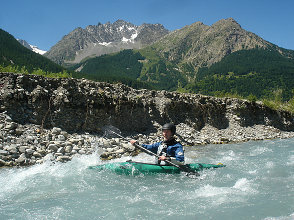 We've also extended the concept to cover a set of rivers in the alps where we have paddled over many years, and some SOC intend to return again this year. although there's a second front being opened in Austria. 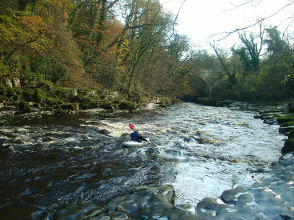 The River Swale is SOC's local river, and it was the intransigent attitude of some landowners towards access that led both to the formation of CRACK and to the annual Swale Charity Paddle, which, for many years, was the only agreed access to the river. Softening attitudes to access in the light of discoveries in law research showing that there is an ancient public right of navigation on all physically navigable rivers in England has led to the river being paddled far more frequently without challenge. 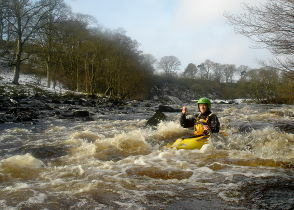 The Tees must come close to being the SOC's favourite river - there are so many different sections, from easy beginner trips to among the hardest trips we paddle regularly, some part of the river can be found to go at almost any level. As a result it appears quite often in our quarterly programme and perhaps even more often on the mailing list for short notice or fall-back trips. 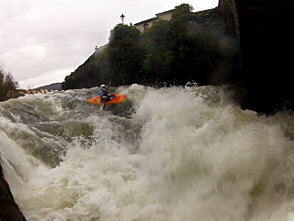 Index photo of Abbey Rapids by Andy Waddington. 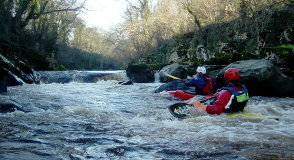 Abbey Rapids is easy to add on to the end of a Cotherstone to Barnard Castle trip and often some paddlers will carry on down at the end of a beginners' trip. 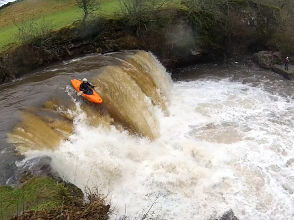 Obviously, if you've just paddled the section upstream, you'll have a good idea of the level, but this section is also one of the easiest to check. 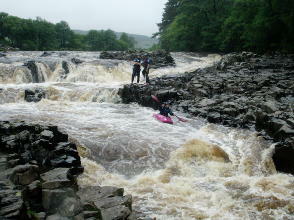 Looking upstream from Abbey bridge will give you a view of the hardest part of Abbey Rapids. 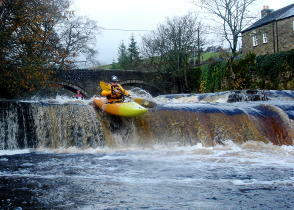 Strictly, the Racing Section is between Eggleston Bridge and Cotherstone, but access to the river has been contested at Eggleston occasionally so if there is enough water, it is usual to paddle from Middleton. Having said that, we have never had any trouble, the lady in the house by the bridge has always been friendly when asked. Alternatively, drop down onto the river from the public footpath, river left downstream of the bridge. Of all the easy rivers we do, the Tees is likely to provide a trip at a greater range of different water levels than almost anywhere else. Consequently, its not only quite likely to appear on the programme, but often offers us a fall-back trip when something else has unsuitable water level or if people just want to nip out for a local trip. Releases from Cow Green reservoir at the top can mean there's water here when other rivers are lower. Probably the hardest river we paddle frequently, club paddlers are probably familiar enough with it that we take it less seriously than if it were far from home. However, it is also very good, so it gets done often, since there is all-year access and the trip will run in fairly low water (often paddled several times a year in high summer). The Tees Greta forms on the moors west of Bowes, the Greta itself up near Stainmore, and it is joined by a major tributary, Sleightholme Beck, which rises near Tan Hill. 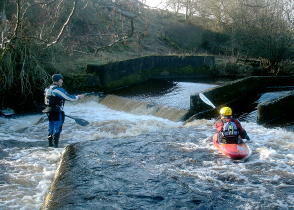 The combined waters flow under Gilmonby Bridge, which is the highest put-in normally used (although club members have paddled from much higher up in big floods, and one trip has also tackled Sleightholme Beck). It's not a river we are likely to put on the programme as it comes up and drops off very quickly - it is difficult to catch at a good level. 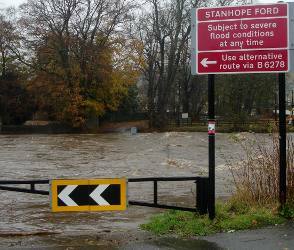 Gauge: there may be a handy (visual) gauge at the ford at Stanhope, but this sometimes gets washed away. However, when the system is working, the Environment Agency provide a page online showing the level at the gauging weir upstream of Stanhope which is just at the downstream end of this run. 11th December 2010 gave a good run, with the gauge around 1.2m (dropping off). 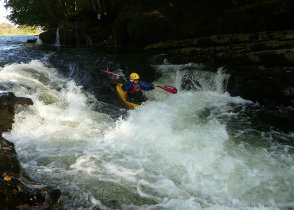 The middle section of the River Wear is a fine, varied, and relatively continuous whitewater run at grade 3, and with a club member living right at the take-out where he can reccy the level, tends to be one of our favourites for a short notice trip when it rains. Like the section upstream, it rises and falls quickly, but as this runs with less water, it does tend to be easier to catch, with more chance of a run in a summer storm. 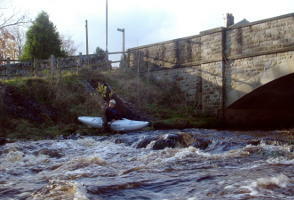 There are three sections of the Wharfe that the club has paddled in recent years, and some more downstream that we hope to paddle again, but haven't visited recently. 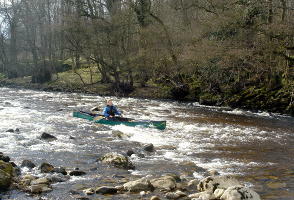 The Middle Wharfe is a relatively easy trip (mostly grade 2) that goes without huge rainfall, with a few harder drops (grade 3) and rapids and one (easily avoided) much harder drop at the end (a good grade 4). 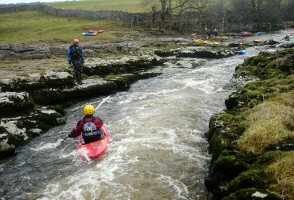 The Upper Wharfe is harder to catch, as it needs more water (to run at grade 3+) but gets a lot harder in very high levels (top end of grade 4?). Although it's not in our immediate area, the Keswick Greta is only an hour's drive from a meeting place at Bowes village hall, and is our most frequently paddled Lake District River. There are several sections of the River Kent, but the one we count as a regular favourite is the part from Kendal down to the A65 bridge, at Force Falls. There are harder sections upstream, but catching these at a paddleable level has proven difficult ! 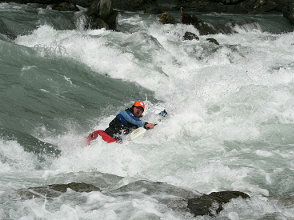 Never really a beginners' trip, the Kent is a good venue for paddlers happy on grade 3 water, wanting to get into a bit of grade 4, although all the harder rapids can easily be inspected and walked round if they look too mean on the day (they do get less forgiving as the water rises). The Lune often runs when other rivers are too low (see notes on hydrology at the end of this page), so it's often a fallback trip when other rivers are too rocky. But it's not second best, and does feature on the programme quite often, too. If the Lune is too low, the Kent may occasionally provide an alternative - otherwise, look for something lake-fed. 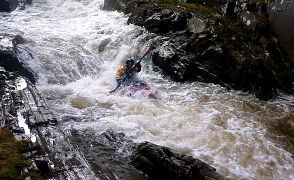 There are two sections of the Duddon that are normally run, and only the lower, easier section counts as a club favourite river at the moment. This runs for almost exactly six miles (9.6 km) from a small off-road parking space by the bridge at Hall Dunnerdale, down to the take-out on the main A595 road at Duddon Bridge. There's a mile of grade 2+ water above this put-in if you want a slightly longer trip that's no harder. 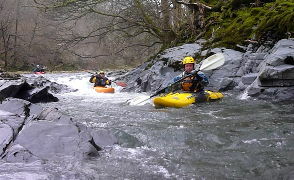 Above that is Wallowbarrow gorge, which is definitely a grade up on the trip described here. 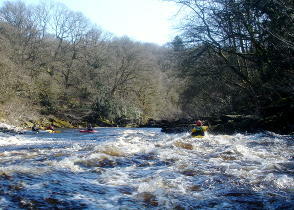 The Leven runs out of Windermere down a series of weirs and small rapids ending at tidewater. Being lake-fed, it often holds its level when you've missed the water elsewhere so is often run as a fallback trip, or as a second river of the day after the Kent or the Duddon. 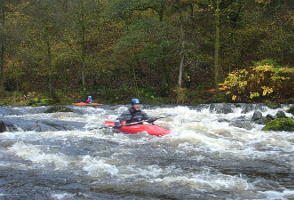 The Nith is in the borders, so is quite possible as a day trip, or can be taken in on the way to or from the Highlands. 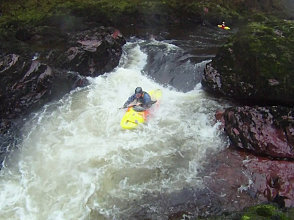 Its combination of being paddleable even in lowish water, decent length of mostly grade 3 rapids with easy egress to the road, and a final harder gorge section, can often make it worth the drive and as a safe bet, it may well appear in the printed programme. Equally do-able from either east-side or west-side bases, the Pattack is a classic river with lots of grade 3 rapids and a culminating set at grade 4 very close to the road, which could be done as a quickie on the way to or from another river. The alps are a bit different from here at home, so grades 3 and 4 don't seem to mean quite the same thing. They may not be do-or-die but we have certainly found them testing enough to provide us with a lot of entertainment and a few heart-stopping moments. Here's a few of the harder rivers we've dared. The alps isn't all do-or-die grade 4 and 5 horror shows with icy water and rockfalls or fallen trees round every blind bend. 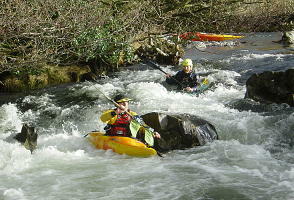 There are some excellent rivers both for family holidays and for any paddler wanting a bit of whitewater in hot sunshine when English rivers are dry and full of those who would dispute access. This page briefly introduces some of the trips we tend to do on holidays in the Briançon area. 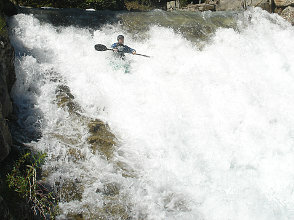 Not all day every day is spent paddling, but for those who need a quick fix on days when Canyons, Mountains or Vias Ferrata have claimed their attentions, there are several places which satisfy that craving, some of which are available after the main rivers have closed at 6 p.m. Of course, most of these spots are also suitable for a half day or so of practicing technique, too and are great spots if you have a tame photographer (or prefer to take them yourself). Index photo of Stuart Ridley on Rabioux wave, by Johnny Proud.